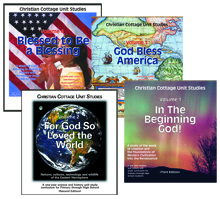 At Christian Cottage, we utilize many different publishers to meet the needs of our students. When we test and evaluate students, we can also prescribe a curriculum plan for them that specifically meets their needs. We pull from over 120 different publishers to find the EXACT curriculum to fit your child’s learning style, your teaching style, and their specific learning level. No two children are alike, and no two curriculum plans are identical. Christian Cottage also helps children who have learning struggles with therapeutic exercises and training strategies to do in the home to help with auditory processing challenges, logic and reasoning gaps, as well as other cognitive skills and deficits. Contact our office today for more information. Christian Cottage products include a line of Reading and Writing programs called Learning Rivers. Learning Rivers is actually 7 programs in one. It includes phonics, reading, spelling, creative writing, rhythmic reading, sight words, and basic grammar. In only 100 lessons children can go from learning their letters and sounds, to mastering every sound and spelling in the English language! This program is especially designed to help children with dyslexia learn to read and write well. Easy English makes reading and spelling easy! 71 carefully sequenced lessons to help the learning flow. New sounds are introduced one lesson at a time with fun exercises and drills to help build success. Students simply echo with the video and do the exercises, read the stories and answer the questions. The program is simple for children to use alone or with a helper. The games are fun and the action based picture directory is handy for practice in the book version and also on video. Progress is great! Many students complete 2-3 levels in one year. writing units for our CCS families for 15 years, we believe we’ve produced a unit study method that is easy on Mom, and fun for the children. Each volume contains 2-week and one-month units planned to include enough science, history, bible, creative writing, literature and fine arts activities for more than one year. They’re easy to use, and Christian textbooks can be used as resources. Four levels of fun and interesting activities are planned daily for first through twelfth grades. Lessons are prepared in a one-day-at-a-glance, easy to use format. No Gaps! Ability-leveled vocabulary and main points make mastery measurements a snap! A home education curriculum pre-tested by hundreds of home schooling families. 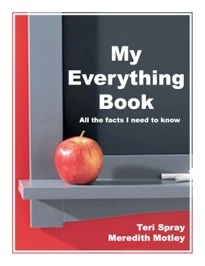 All the facts I need to know – My Everything Book Here is your resource guide to all of the things you need to remember for life. Now you can flip-and-find-it-fast. The Everything Book helps students of all ages. From learning your letters and basic math facts, to Life Management skills, this book will help you navigate through life with all of your basic skills at your fingertips. Your Everything Book is your new best friend! 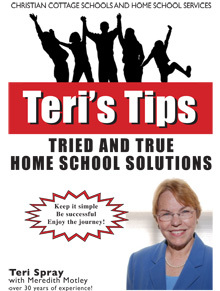 Teri’s Tips: Tried and True Home School Solutions – Teri has written down everything she knows about home schooling, from her 35+ years of experience to help you “Keep it simple, Be successful and Enjoy the Journey!” Including How to’s on getting organized, staying on track, and teaching with meaning and mastery.